The February 2017 Virtual Paintout was in Nashville, Tennessee. 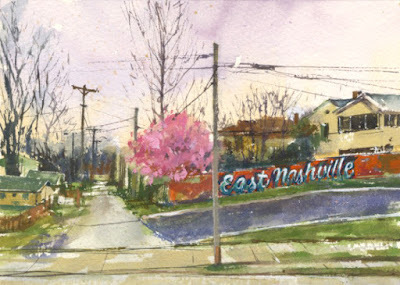 The Virtual Paintout is in a different city or country each month, chosen by creator and host, Bill Guffey. I really enjoy virtually looking around for a view to paint in the many places that I'll never be able to visit in person. But this month was Nashville! There have only been a few Virtual Paintouts in cities I've visited. I haven't seen much of Nashville but in 1996 we drove from Southern California to the Olympics in Atlanta. 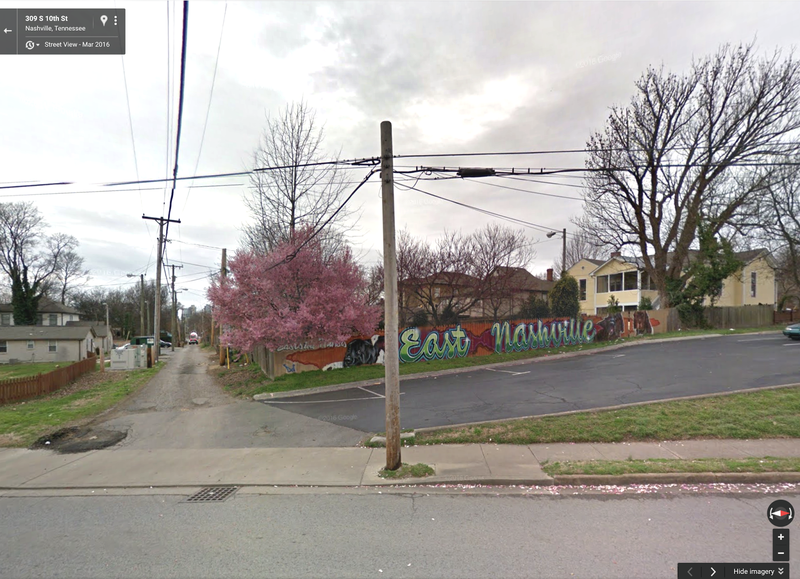 The highway mostly stayed on the outskirts of the city but we did stay that night in south Nashville. I looked around the area on Google Street View. There were some wonderful, rustic views. That was something I enjoyed about this month's city, great landscapes and also nice city views. 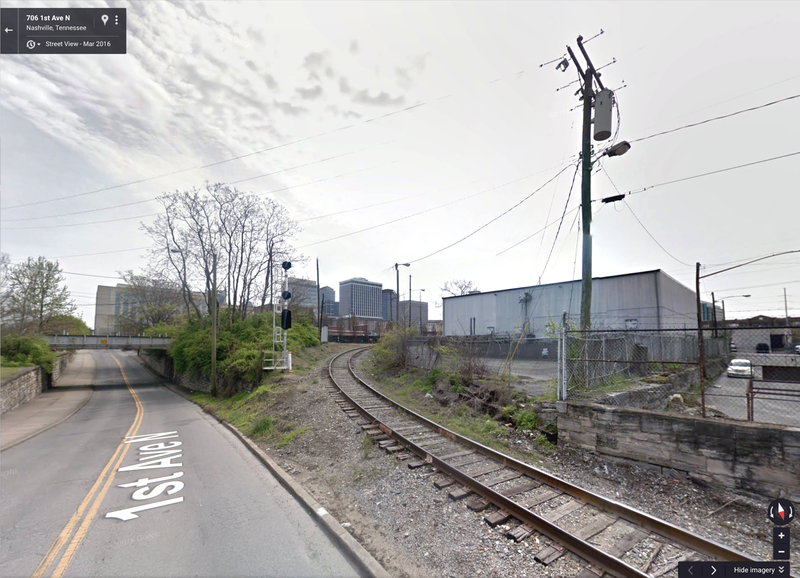 Looking forward to next month's location. 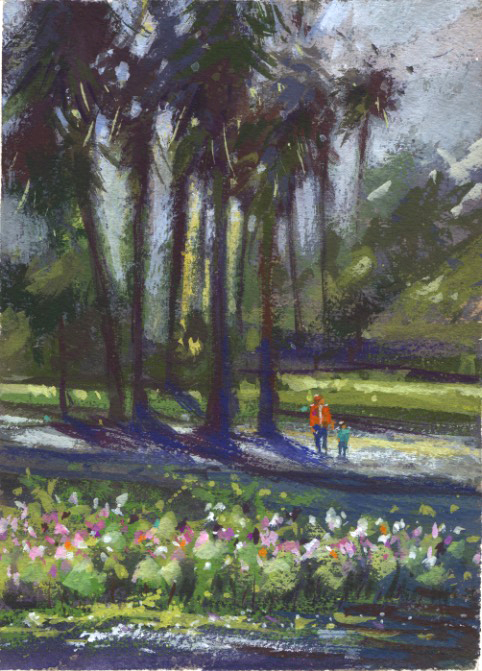 Our paint-out group will be at Echo Park in Los Angeles tomorrow. 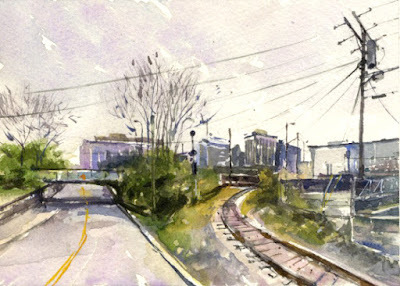 But here is another gouache piece I had not posted on my blog since we painted there in July. Time to catch up a little! My previous blog post was a gouache piece from our plein air paint-out at the lake in 2015, Boathouse Umbrellas. I'm also sharing another gouache piece from our Echo Park visit in 2013! I was ambitious that day and painted a watercolor and also a gouache piece. I ended up painting over some of the gouache and hadn't really finished it until now. So here are two gouaches, finally completed. I'm wondering what will catch my eye at the lake tomorrow. Jimmy painting the 1932 boathouse. 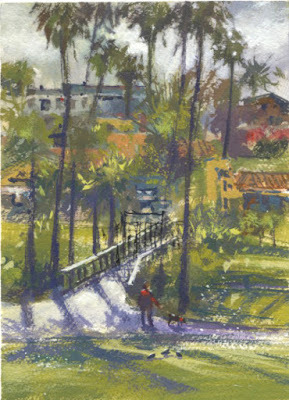 Fuller Seminary in Pasadena is on our plein air paint-out schedule. I realized I hadn't posted my gouache piece from our paint-out there a year ago. 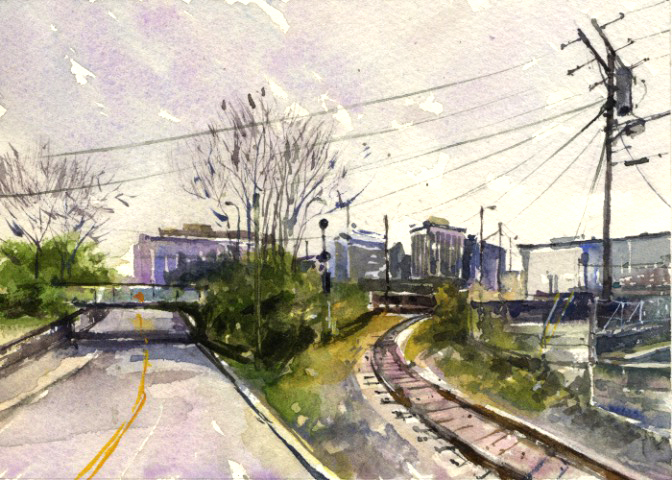 It was a chilly, overcast day in February 2016 when I painted this piece. The bare trees caught my eye. 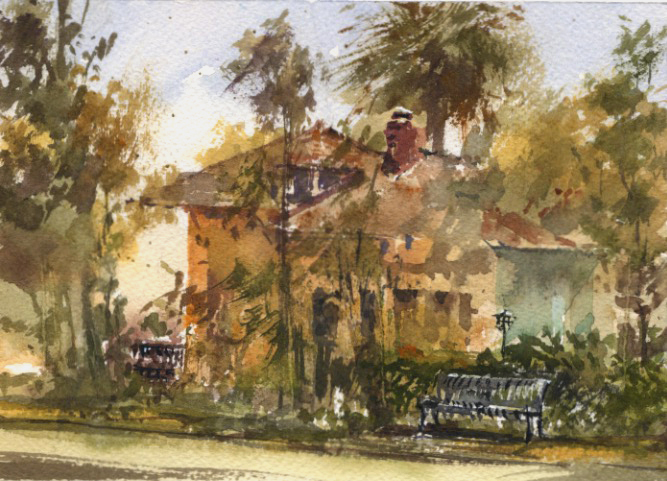 On my previous visit it was a brighter day and I painted a sunny watercolor, Fuller Seminary. I'm including a photo of my friend and fellow painter, Bill. He had his back to the walkway but I had a nice view of the many people passing by and taking a phone photo of Bill at work on his oil. We wondered if any were posted on Instagram. Last Saturday the paint-out group met at Singer Park in Pasadena. 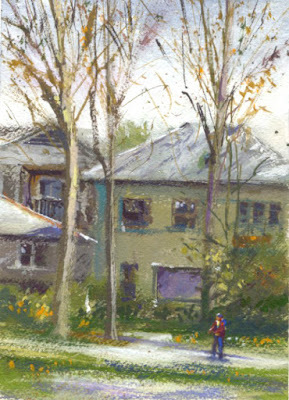 I painted there once before and posted my gouache piece in Grant and Singer. Unfortunately I arrived late and spent time chatting with fellow painters, as painting time went by. I almost left since it was getting late. But of course, I do like to try a painting when I've gone to a paint-out! From a shaded picnic table there was a nice view of the pretty home next to the park. Just enough time to paint a small watercolor which got too "busy" to add the "moon" park lamp.